In anticipation of her presentation at eMetrics Summit in New York City, October 23-27, 2016, we asked Laura Patterson, President at VisionEdge Marketing, a few questions about digital marketing analytics. 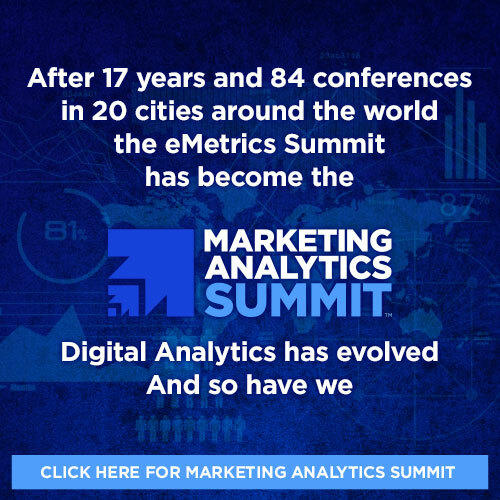 Check out Laura’s interview in relation to her eMetrics Summit presentation entitled, Moving Up the Leadership Ladder with Analytics. Q: What was the most surprising insight you or a client discovered recently? Laura: Being able to identify how to create value for your customers is the ideal. It makes you, what we call, a Value Creator. Value Creators help drive strategic business decisions while improving effectiveness, and making course adjustments. This particular and elite set of marketers excels at engaging the C-Suite because of their business acumen, data, analytics, and metrics prowess. A customer of ours recently discovered the implications of operating in this class. This company recognized that their customers had different buying journeys depending on their profiles. As a result, they created different “plays” and content so that their message would resonate with each individual profile. They were seeing indications of stall outs in the process. When they brought us in, we realized that they hadn’t gone deep enough and considered the different personas within each profile. By working together we were able to revise their approach. They are executing a more nuanced strategy and seeing improvements their overall win rate. Q: What still doesn’t work that we should have fixed by now? Laura: Analytics. Perhaps you’re familiar with the Salesforce State of Analytics report which emphasized how critical analytics are to driving a company’s overall business strategy and operations. If you are, you would think that Marketing organizations everywhere would be striving to increase their data collections and analytics. At VisionEdge Marketing we have seen through our 15 years of conducting a Marketing Performance Benchmark Study that this is not the case. Our research suggests that 75% of marketing organizations still need to do a better job of addressing analytics. Even many of the Value Creators have room for improvement to Master analytics. In today’s data rich environment, every marketer needs solid analytical skills. Q: What’s the one thing companies consistently get wrong about analytics? Q: Name three resources you follow about analytics. Laura: It’s hard to name just three! In the interest of being concise, three analytics experts to note are: Bernard Marr, Neil Patel, and Dr. Kimberly Whitler. I also follow Theresa Kushner, Vice President of VMware’s Information Innovation Center, and, of course, Jim Sterne and the folks associated with the DAA. Q: What’s coming over the horizon for you company and/or your clients? Laura: In the words of Tom Davenport, for companies to become true analytics competitors, Marketing is going to have to serve as an organization’s Center of Excellence. While Value Creators, who represent 20%-25% of Marketing organizations, have already made impressive strides in exemplifying a Center of Excellence, the rest of the pack still have their work cut out for them. This is an in-depth topic, so to dive deeper, read one of our white papers on the subject. They are available for free at http://visionedgemarketing.com/enhance-your-know-how-with-white-papers/. Q: What are people going to learn in your presentation at the eMetrics Summit? Laura: Moving Up the Corporate Ladder with Analytics, is going to explore the skills that all marketers need to thrive in today’s fact-based, data-to-insights driven environment. The goal isn’t to turn all marketers in data scientists or analysts, instead the goal is to make all marketers and their data relevant to the decisions of the leadership team. Don’t miss Laura’s presentation, Moving Up the Leadership Ladder with Analytics at eMetrics Summit in New York City, October 23-27, 2016. Click here to register for attendance.